Extra Large Size for Extra Scary Fun!!! Larger-than-Life-Size Creepy Fake BLACK Spider, as pictured. Giant Heavyweight Plastic Creepy Lifelike Spider coated with crafts flocking. Black Widow may have just killed her mate! 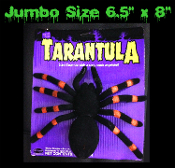 Realistic fuzzy flocked plastic spider is a fun addition to Halloween party, haunted house, witch's den, voodoo scene or as a joke gag gift for that skittish bug-aphobic friend or family member. Place this creepy crawly spider on a shelf all by itself or tuck inconspicuously in dark corners or among other Halloween decorations, where guests will least expect them!